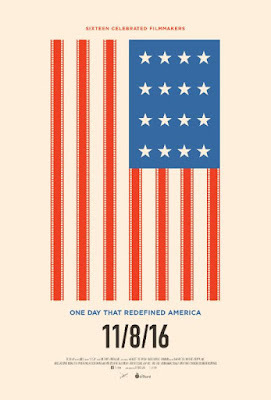 Film-Arcade.net: Official Trailer for the Upcoming Political Documentary "11/8/16"
Official Trailer for the Upcoming Political Documentary "11/8/16"
The Orchard recently released the official poster for the upcoming documentary 11/8/16. The documentary focuses on the hours leading up to Donald Trump's unexpected election night victory. "11/8/16" hits ITunes and theaters in limited release on November 3rd. On the morning of Election Day 2016, Americans of all stripes woke up and went about living their radically different lives. These were the hours leading up to Donald Trump's unexpected, earth-shaking victory, but, of course, no one knew that yet. With 11/8/16, producer/creator Jeff Deutchman's second installment in his election film series, viewers are afforded a uniquely cinematic look at the chaotic glory of American democracy from sea to shining sea. Featuring footage captured by a carefully curated group of some of America's finest documentary filmmakers, 11/8/16 follows sixteen subjects spanning the country's geographic, socioeconomic and political divides through the course of that history-altering day. 11/8/16 was an election unlike any other. 11/8/16 brings us back to that day with the immediacy of great nonfiction filmmaking, and shows the vibrant directness how life happens as history is being made.